Need more information about booking Home 7009833 ? 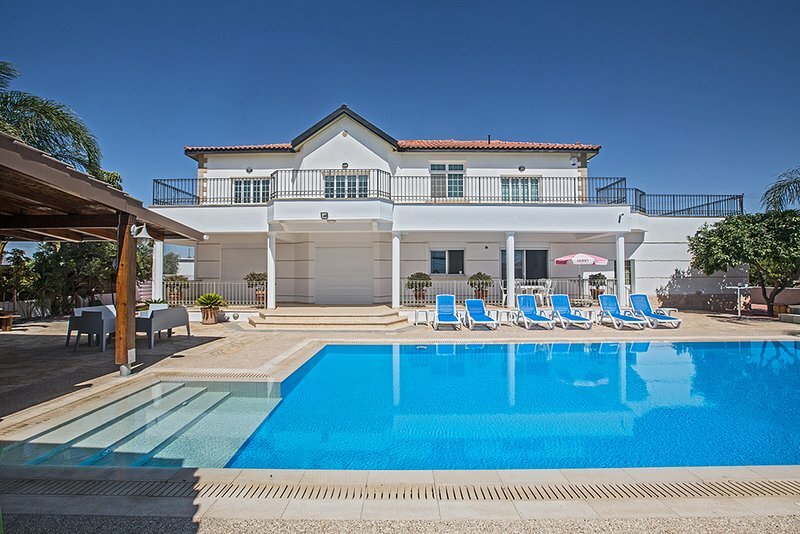 Situated in a prestigious area, on the outskirts of Paralimni Town, and just a few minutes drive away from the renowned holiday resorts of Protaras and Ayia Napa, this large villa makes an ideal holiday let. WIth four bedrooms in the main house and one in a separate annex, the property is perfect for those wanting to spend time with family and friends in a spacious and relaxing setting. Kokkinos Gremmos (Red Hill), one mile away is ideal for enthusiastic walkers and cyclists. Breathe in the fresh air and enjoy the spectacular views of Ayia Napa, Cape Greco, Paralimni and Famagusta Bay. The villa is set on a very quiet road with views of the surrounding hills and fields. It is set in 1250 square meters of land with ample parking and is surrounded by olive and pomegranate trees on one side and a variety of fruit trees on the other. To the rear of the property is a pool which is not overlooked, a large kiosk with bar for alfresco dining, a further kiosk with seating, a rock garden and a Greek island-style seating area under the shade of the grapefruit and pomelo trees. By the pool is an independently accessed one bedroom apartment comprising a double bedroom, shower/wet room and kitchen/bar. This ground-floor apartment has wheelchair access and has been especially designed with additional facilities such as support hand rails and a drop-down seat in the shower room. The main villa provides four double bedrooms on the first floor. Bedroom one has twin single beds with fitted wardrobes, a dressing table, two bedside tables and patio doors opening onto a large veranda. Bedroom two, with en-suite bathroom, has a double bed, fitted wardrobes, a dressing table, a bedside table and patio doors opening onto a large veranda. Bedroom three has a double bed, fitted wardrobes, a dressing table and a bedside table. Bedroom four has a king size bed, fitted wardrobes, a dressing table and a bedside table. All bedrooms have their own hairdryer. A travel cot and high chair can be provided at no extra charge, on request. Off the spacious hall of the main villa is the open plan reception room leading onto a large veranda, a fully fitted and equipped kitchen/diner with American style fridge/freezer, electric oven, microwave, hob and extractor fan. The washing machine and dishwasher can be found in the utility room, off the kitchen. As well as a cloakroom, the downstairs also boasts its own gym. Bed linen, bath and hand towels are provided and changed weekly. Extra linen and towels will be available at the villa. A cleaning service is provided. On arrival, you will be greeted by our English-speaking manager, who will provide you with the keys to the property. The manager will familiarise you with the accommodation and services. If not convenient on arrival, he will arrange to go through everything with you at a time that suits you. The manager will also be contactable at all times to support, advise and help you throughout your stay. A complimentary welcome grocery pack with everyday essentials will be provided together with basic toiletries such as hand-wash, shampoo and shower gel. We have negotiated rates with a local taxi firm for trips to and from Ayia Napa, Protaras and Larnaca Airport. The telephone number will be at the villa. We wish you a relaxing and comfortable stay.